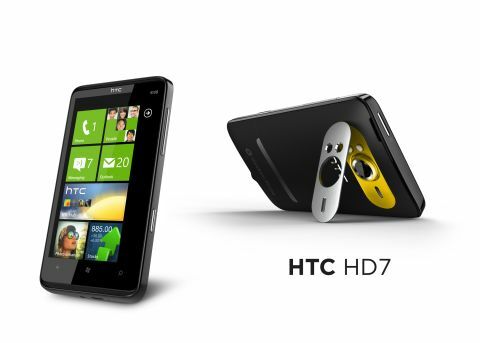 The HTC HD7 is by far the biggest of them, with a Desire HD- and HD2-matching 4.3-inch screen atop the near-identical hardware specs of its other WP7 brethren. In the hand it feels a bit gargantuan – smaller hands might struggle to contain its heft, but luckily it feels thin enough to not give the impression of a small netbook in your pocket. The screen makes up most of the phone when turned on – apart from a thin strip of glass at the bottom that holds the touch sensitive buttons, this is very much all about the screen, which makes sense when you consider how massive it is. Our only gripe is that it's not an OLED screen – the Samsung Omnia 7 has the edge on the HD7 on screen quality, and we would have loved the vibrancy of that tech at this screen size. There are speakers either side of the HD7's screen. When you're watching movies on the go, and want to annoy your fellow train commuters, this is the way to do it (we prefer the headphone option – call us mental for that). What's interesting is the 3.5mm headphone jack is on the bottom of the phone – it's a sculpted option and headphones fit in nicely. Some people like it there, but given most phones have it at the top, it's hard to get used to the fact the phone feels upside down in your hand. The 5MP camera on the back is a little more tech-heavy than its brothers, offering a dual-LED flash that can also be used as a video light when capturing HD video at 720p. There's also an exceedingly playable-with kickstand on the back, propping up the phone for when you want to look at things and you need your hands for something else. We're told the kickstand can take force from above and will close safely rather than snapping off... but we're not testing that theory in case it's wrong. What's more worrying is the damage you can cause to the back; all the exposed metal gets very easily scratched and in a few days we had a pretty war-torn phone on our hands. The top power/lock button can be hard to reach if you're of the teenier-handed variety, but then again this phone might not be for you if that's the case – perhaps check out the HTC 7 Mozart instead, which offers a similarly decent chassis feel with a more palatable screen size. That same button can be hard to hit as it's so flush to the chassis, which is annoying since it's the one that's supposed to be used to the most to lock the phone; if it was a smaller handset, it wouldn't be an issue. We like the way the HD7 looks and feels, but we get the feeling that some people will dismiss it as 'too big' instantly.